As I look at my calendar, I see that my last Daybook Edition was written in April. Oh my! I ask you, how did Spring's April slip into May and then into June, pass like lightening through July and almost sweep August off its feet as we merrily waltz toward September. It doesn't seem to matter whether we do much or little in a day or a month, it all seems to fly by at warp speed. Rick and I just returned from a road trip to the West Coast for a family visit. 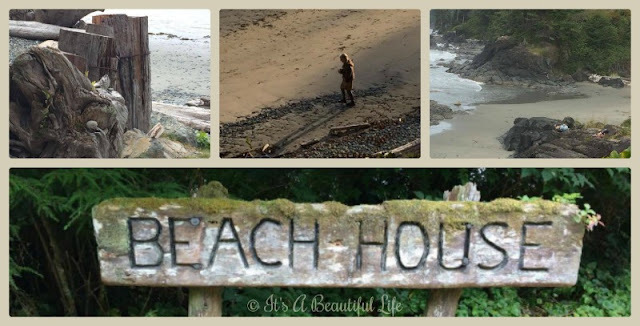 A dear sis-in-law celebrated a special birthday this month, and we gathered on Vancouver Island at a gorgeous place called Point No Point. Our view of the ocean from Bridge House, our home away from home, was truly s-p-e-c-t-a-c-u-l-a-r. I think all our mouths were agape in awe when we first arrived -- to find the ocean right outside our verandah door. 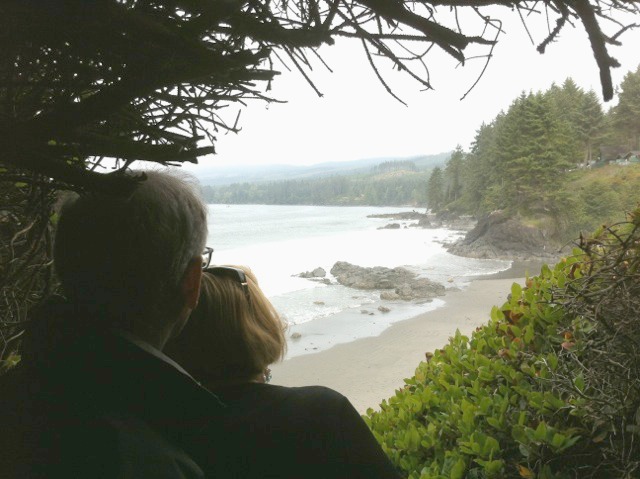 Above, you see the two of us watching the waves from our perch further up, photo courtesy of my brother-in-law. This is a spot on God's green earth where one can find rest for the mind and healing for one's soul. And, at night, there it was, the rhythm of the waves soothing most of us sound asleep. holds one in its net of wonder forever. too greedy, or too impatient. waiting for a gift from the sea." 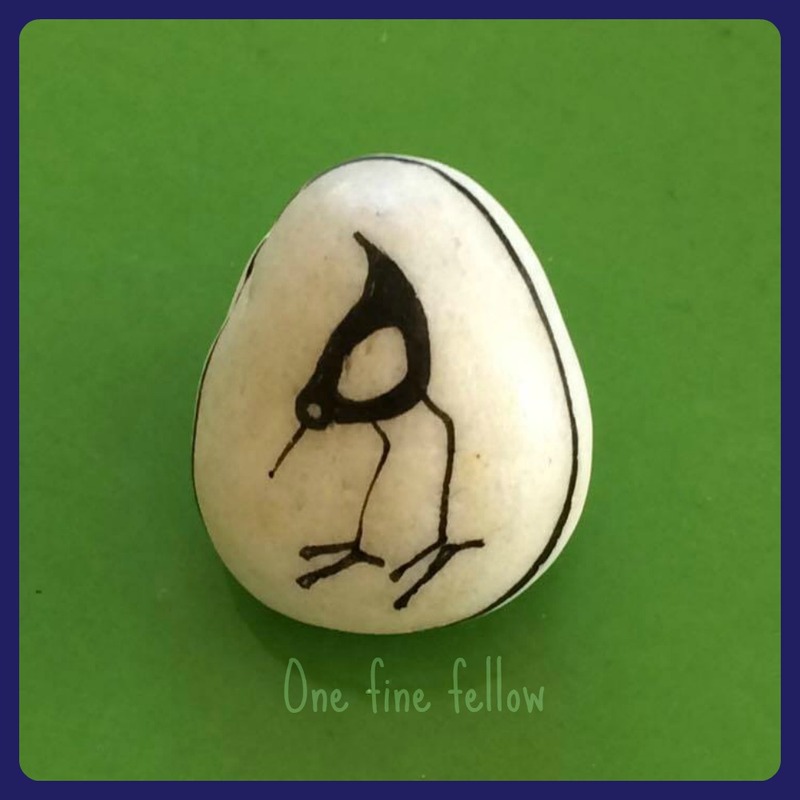 Isn't this the cutest rock painting of one fine fellow? Not sure who the artist is, but I'm happy to have found this little treasure and others like it in the Point No Point gift shop; they had a whole basket of rocks painted with tiny creatures. 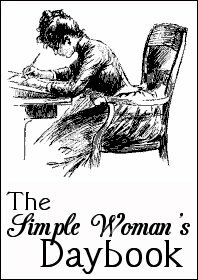 I'm happy to offer the August edition of The Simple Woman's Daybook. we whisper a prayer for safety and grace through this time. We're so sorry for your turmoil and your loss. Looking out my window... Well, it wasn't so much about looking out my window this early morning when I started work on my new post; it was more about hearing the sounds in the neighbourhood. Well before eight o'clock, children were outside playing. Highly unusual for this time of day, but we delighted in the cheery sounds. Maybe cousins or far away friends came to visit overnight; it seemed anyone under ten was up and ready to take on the new day -- perhaps as a last hurrah of summer holidays. I am thinking... about our human need to remember. Thankfully, we have the wondrous ability to recall fragments of past memories through our senses: sounds, sights, or smells. I take great pleasure in reading books and memoirs by authors who have the flair, as former Victoria editor Nancy Lindemeyer once said, "to capture the gestures, the furniture, and the fabric of bygone times, and help us all go home again." I am thankful... for the days and stretches in time that come my way when life's rhythm is easier and less complicated than others. I am in a place like that right now. No doubt we've all had seasons to cope when we've been rushed off our feet, trying to take in another round of bad news ... all to the moment where we think the top of our head's going to blow off. Like the ocean waves that ebb and flow, we somehow learn to ebb and flow with the seasons in our own lives. But I am so glad for the quieter, more sane times. One of my favourite things... is to sit out on the deck and watch the birds as they vie for spots at the feeders, and especially when they decide to take a dip in the birdbath. How they enjoy the moment, wings fluttering and splashing, as water drops catch the sunlight. The young ones are especially fun to watch, shy and eager at the same time, in their debut of this experience. Some will jump in; others flutter nervously on the edge and return to a safe perch, foregoing the pleasure. Just like people -- maybe we share more with our feathered friends than we realize. I am wearing... a cool summer dress, ballet-like slippers, and glass bead earrings. No bracelets to jangle at this time of the morning. I am creating... something new in this space today. You see, I'm not much of a craftswoman at this stage of life (although I once was and I might become again). So I decided to google the question "What are you creating today?" to see what other people are up to -- perhaps someone else's creativity will inspire me with an idea for this prompt. And, true to form, Google gave me a list of possibilities in response to my question. A blog post to a piece entitled What Kind of Future Are You Creating Today written by Dr. Judith Rich in 2010 and updated in 2011 caught my eye. Yes, a different kind of creating, so we went to see what she had to say. Her message was similar to something I discovered for myself a few years ago, that is, we create our future through the words, actions, attitudes, choices we make in the present "today". Even though this post was written in 2010, the author's message still resonates, what with all that's going on in our world these days. The post feels a tiny little wordy (I'm one to talk) but I do invite you to take a peek, you might find something that gives you courage to create a future about which you're dreaming. 2. Martha's Vineyard: Isle of Dreams by Susan Branch. A perfect summer read, I am re-reading this delightful book in which Susan shows how her drastic move across the country to Martha's Vineyard was the godsend she needed to recover from her broken heart and lost dreams. As she starts over, with new kittens to keep her company, she slowly builds a new life and dreams new dreams. Like any good memoirist, Susan shares her own story so that her readers connect as they remember similar emotions and their own places of brokenness and lost dreams. She makes us laugh with her (oh, I love how she makes me laugh) and nod our heads in understanding, and she gives her readers the hope that good things can come to anyone no matter who they are or what they've gone through. 3. 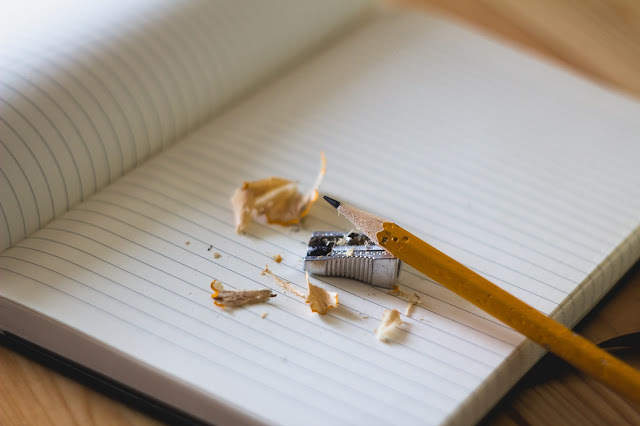 Finishing School: The Happy Ending to That Writing Project You Can't Seem to Get Done by Cary Tennis and Danelle Morton. I share a short review of this encouraging and helpful new book here. This book showed up in my world at a perfect time -- I love how that happens. I am watching... summer turn into pre-autumn. Yesterday I saw hints of it along the boulevard where trees already had yellow leaves. We still have lovely warm days, but the nights are cooler. I overheard... a little conversation with one teen and her mom standing behind me while waiting in the long line-up at Staples. She wanted to get 'this', 'this', and 'this', plus she really wanted a fourth 'that'. Her mom says, you can have 'this' and 'this' and the 'that', but not 'this', 'this', 'this', and 'that' too. You have to choose, there's a budget. Or, you can buy it yourself. // Daughter says that her wallet is in the car, then adds in a softly spoken, yet incredulous, "You're making me pay for my school supplies?" Not trying to listen to every word, I'm not quite sure how it sorted out, except I saw the teen leave the store, I assume to get her wallet. // Ah, the joys of growing up and learning about budgets. I am hoping... to get this post completed and up for Wednesday. As I write in this moment, the kids next door are back outside and having the time of their lives. I think they must have a little pool in their backyard along with the trampoline. We know for sure there's a trampoline -- we oft see the tops of heads bouncing past the six-foot fence between our yards. For all the screams, there seems to be water involved. I hope that summer stays a while longer for all our enjoyment. I have been learning... some new words of late. Thinking I should smarten myself up with a few new definitions, I participated in a couple of online literary terms quizzes to see just how much I knew (or didn't). It was fun -- I felt like I was back in the school room. Fortunately, there is no knuckle-wrapping, scolding, or marking work with a red pencil. In fact, they encourage a person to do the quizzes over so you can ace it. I like that! And, no, it's not cheating; testing yourself several times to see if you know something makes use of a technique which helps the brain learn more solidly. INDITE: "The verb indite, rarely used today, means "compose" or "put down in writing," like when you find a quiet place to sit down with your notebook and pen and indite a journal entry or a first draft of a short story. // To indite is to write something creative — you indite a letter and jot a grocery list. Don't confuse indite with indict, which means "to charge with a crime." Both come from the Latin word dictare, meaning “to declare.” Even if you indite a really bad poem, critics won't indict you." EPIGONE: "Someone who copies a well-known poet, closely imitating her style, is an epigone. You are also an epigone if you admire and imitate another kind of writer, a visual artist, or a musician. You can also use the word to describe the follower of a particular philosopher, or an admirer of a famous chef, especially if you imitate her cooking style." Any Julia Child epigones out there? LITOTES: Derived from a Greek word meaning "simple", it is a figure of speech which employs an understatement by using double negatives or, in other words, positive statement is expressed by negating its opposite expressions. e.g. it's not bad at all, she's not a bad singer, not unhappy, she's no spring chicken, it wasn't a terrible trip. In the kitchen... For supper, we're having burgers, fried onions, corn on the cob, and fresh plums for dessert. Simple, yummy, and satisfying. In my garden... the Peace Rose finally takes a rest. She certainly outdid herself all summer long; at one point, she had almost two dozen blossoms and buds. What a winner. That's a record for roses in my part of the world, or at least, in my not so big Alberta garden. And I think I just used litotes in saying 'not so big' Alberta garden. A favourite blog... Today I want to share a link to a blog I have been following for years now. Some of you already know her: Brenda from Coffee, Tea, Books and Me. In her most recent post, she tells her readers she's starting her 12th year as a blogger, a long time in the world of blogging. She shares a lovely look back at her journey as a blogger, a reader of fine books, and a woman of faith who has learned how to stock a great pantry. A last peek of our visit to the ocean...We sat around in comfy verandah chairs and visited; we climbed over big rocks to get a better view and perched on a bright red bench overlooking the water. We trailed through woodsy areas with tall, tall evergreens and masses of ferns giving off a spicy scent. We watched sailboats go by and one cruise ship lit up with fairy lights one evening after it grew dark. It was all enchanting. Something I'm mulling... Not quite letting go of summer, but thinking how to get ready for autumn's dramatic changes. 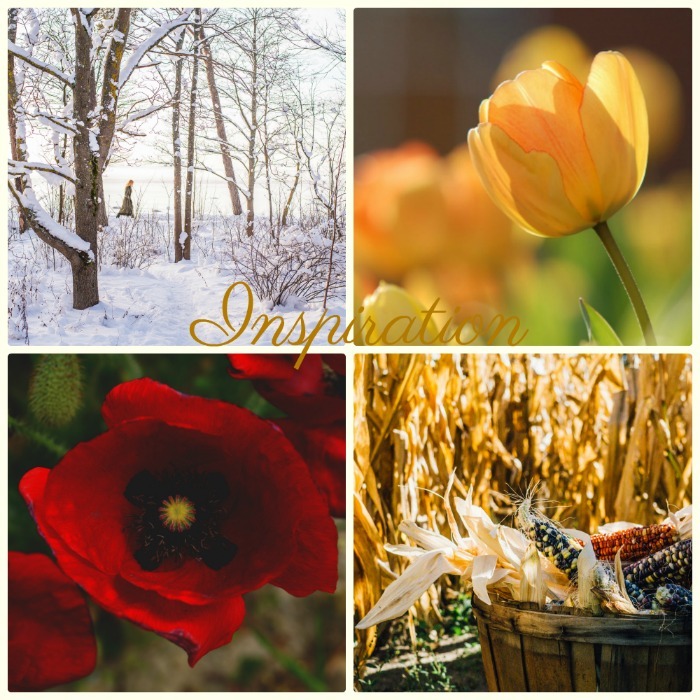 I'm also thinking about how we can use the seasons as a source of inspiration for ourselves and our work, whatever form it takes. The truth of it is that many of us already do this maybe without even realizing it. As the seasons change from warmer to cooler and visa versa, we change our wardrobes, the recipes we make, and our home décor. If you notice, it's mainly to accommodate or adapt to the weather, temperatures, and equinoxes. I never saw that before. Maybe it doesn't matter, but it's an interesting bit of info. Claire Murray confirms this in one of her now out-of-print magazines, La Vie Claire, "Seasonal transitions...involve re-outfitting ourselves and our homes. Come fall, we pack away our summer cottons and linens and unpack our woolens and knits. We take the light floral comforter off the bed and exchange it for one made of goose down." Claire goes on to say, "Nature serves as the inspiration for so much of my work and the work of others. ... Nature dazzles us in the fall with abundance, variety, and color. It is a season of dramatic change, and as we tune into its rhythms, we find ourselves desiring changes -- big and small -- in our own lives." I started to mull what other changes we make as the seasons shift. And I wondered if I could be more intentional in watching for inspiration ... and to watch what other people do to create beauty and wonder in their lives from season to season. summer an oil painting, and autumn a mosaic of them all." I found this line penned by Stanley Horowitz, and decided to see if I could create a simple collage that portrayed what he was getting at. Had to do a little research to sort out how an etching, a watercolour, and an oil painting could symbolize the seasons, and why he thought they could. And, then consider how autumn could be a mosaic of them all, what that might look like. Etching allows dramatic contrasts between delicate and heavy lines, and has the spontaneity of sketching, according to an article from finerareprints.com. I can see why Horowitz calls winter an etching, can't you? Barren trees 'etched' against a grey sky, the form is there but not the details. The glowing transparency and spontaneity of watercolour makes it an ideal medium for exploring the effects of sunlight, shadows, mist, stormy skies, including nature's bounty in flora and fauna. Often watercolours are used in gentler, softer ways ... maybe representing the hopefulness and the 'not quite there' of the new season. When it comes to oil paintings, I tend to think of something brighter, deeper, bolder, opaque. So, is Horowitz right as he describes summer that way? Poppies are summer flowers and that photo I found on unsplash.com seemed to convey that feeling. Autumn is a mosiac of them all ... well, what does he mean by that? My sister and I chatted about it yesterday; autumn to us does have a sense of new beginnings -- a little like Spring -- not so much in the plant world, but it's the start of a new school year and we start new projects after a summer hiatus. The bold exuberance of summer certainly shows itself in the autumn colours of trees turning orange and yellow and russet, not to forget the bright berries and rose hips. And once the trees drop all their leaves, we have the etching that we will see all winter against those grey skies. Have I come to any conclusions? Not yet, but it's been fun to think about as the new season approaches. I'd love to hear your thoughts about it. Closing note... I have mused and typed my way towards lunch ... egg salad sammies with pickles and tea. Hubby is back from exercise at the gym. So I shall call it a wrap for today. "And you know what helps loneliness (and a whole lot of other things)? Beauty. Your heart can be sad, but it will leap at the sight of the moon on the water, or when light flickers through the leaves and flutters like butterfly wings on the wall. You might fall back into sadness, but then, thank goodness, you see something else, even the smallest of things, a pink rose in a vase, an amazing line of inspiration in a book, kitty paws the way they fold over each other, and it leaps again." Oh yes, Susan, it's true, I have felt those exact things so often. Thank you for those words. And, now wishing you all grace for your journey today. I'll be reading this lovely post more than once, dear Brenda. You give us so much to ponder. Agreeing with Elizabethd . . . much to ponder here in your daybook. I began nodding my head with you about the speed of passing time. I soaked in the ocean scenes and imagined how it must have been to fall asleep listening to the lapping waves. I took a little rabbit trail to learn about Anne Truitt (a fellow Marylander). I read the definitions of your new words which are new to me too. And I enjoyed the Susan Branch quote. Ah yes, that search for beauty. Off to bed I go (too late . . . again). Thank you for the ponderings. Lovely to catch up with you and to know that you have had a good summer! Many beautiful thoughts, your heart is full of Joy when you are writing !! Dear Brenda: How I love this post and will read and read again. I enjoyed your new words, new to me as well. I can tell you I am definitely a Julia Child epigone. The photos of your trip were beautiful and the area looks so very relaxing. Your sweet painted rock is a forever treasure. I always enjoy your book suggestions and also enjoy Nancy Lindemeyer. I have a book written by her, "Jenny Walton's Packing for a Woman's Journey." I somehow think you lead me to this book. Enjoy these last days of summer. Our nights are beginning to cool as well. Fall does seem to be arriving a bit early this year. I have quite a stack of books and honestly, I am looking forward to winter. Hot tea, good books and a comfy chair. It can't be beat ! Thank you for your beautiful and inspiring words. Your blog post are an absolute treat to receive ! This post is full of so many wonderful thoughts and musings. It's lovely. I like your analysis of Horowitz' quote about the seasons and art; you have great insight. As someone who has been to Point No Point, I have to agree with you about the beauty. 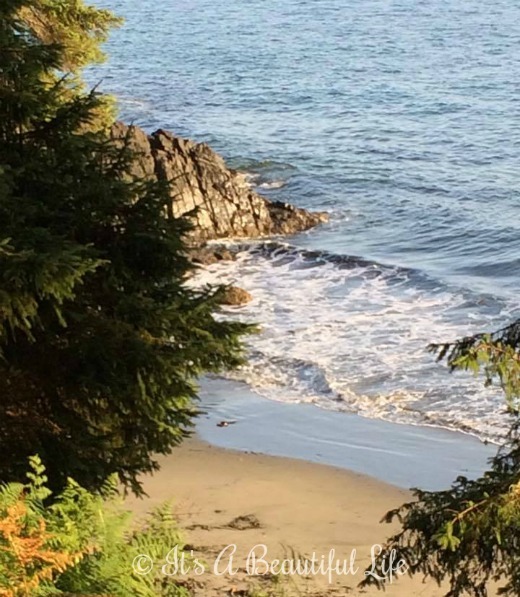 When I saw your photo on Facebook, I first thought you might have been in Tofino. 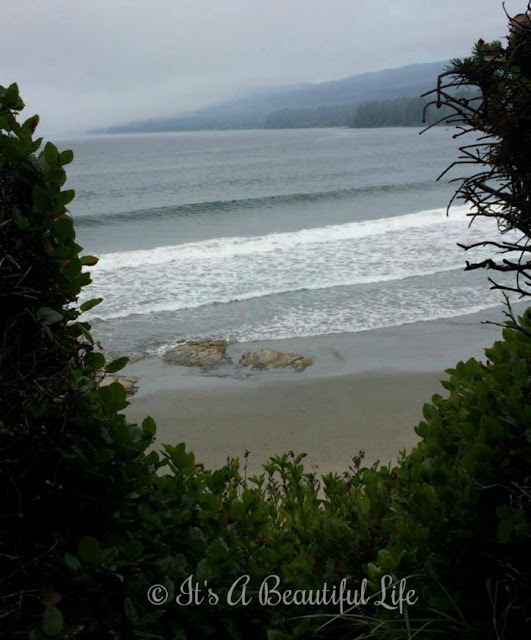 Our west coast is rife with gorgeous scenery. I'm so glad you enjoyed yourselves. Someday...we must get together for tea when you are out here. Dearest Brenda - your post was just so wonderful. It brightened my day and filled me with joy. As always your writing is such a delight to read. Thank you for sharing. Hope you have a delightful weekend. Hugs! I used to love doing the "Word Power" quizzes on Reader's Digest years ago. You've inspired me to check out Vocabulary.com to improve my vocabulary! What a beautiful post to read! Also, I noticed on your sidebar you have "Perfect Day" listed. It's one of my favorites. So beautiful! Greetings from Chester. I enjoyed reading. Nice shots. You certainly have a beautiful way of putting things, I could have just kept reading all night! I love the West Coast, if you are fortunate enough to live or visit there, you truly have something to write about. Thank you for sharing your vacation with us. I really enjoyed reading your daybook. I have to agree with you, changing from summer to fall is always interesting, putting away the summer things, and taking out the winter things. Whether it's clothing or decorations, we just do it automatically, don't we. I'm so looking forward to fall, here in Idaho, it has been a long, hot, smokey summer. Your blog is so nice, I'll be back soon! Vancouver is such a pretty place and your vacation sounds wonderful. I too love the changing of the seasons. I'm never ready for summer to end, but when the temperature starts cooling down and the feeling of fall is around the corner, I start getting excited and the same for the first snow fall, then spring and summer. I do love the change. You have a nice blog, glad I stopped by! You have to beautifully written this it makes me dream about it going there my self. Hope I can have next summer like this with my family.